Three days before the 1983 election, I attended a rally in Oxford Town Hall. It was in the days when it was still possible to come in off the street to a Labour leader’s rally, and the speaker was Michael Foot. The atmosphere was revivalist, a packed hall cheering on their much-loved leader. How could Labour possibly lose in the face of such enthusiasm? But of course the result is history. 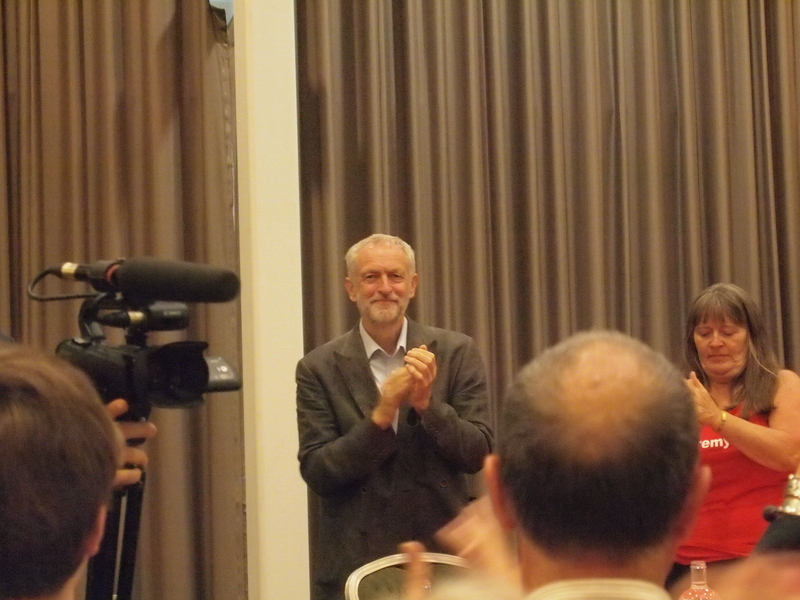 More than thirty years on, I found myself attending Jeremy Corbyn’s leadership campaign rally in Cardiff – according to media coverage one of the largest political gatherings in Wales since the Miners’ Strike. The atmosphere was incredible – more than a thousand people crowded into the hall, standing room only, people with decades of Labour activism behind them, others coming to politics for the first time. At its heart, a speech by Jeremy Corbyn that was passionate and powerful – but also detailed; this was not rabble-rousing but thoughtful and argued through. He was given a massive ovation by an eclectic audience. And I reflected – could we be deceiving ourselves in the same way that we were in 1983? Was this just an audience of the converted, wanting to be enthused, oblivious to the harsh political realities outside? But this time the fundamentals feel very different. In 1983 the Thatcher myth was at its most potent. A year beforehand, the Task Force was still steaming south to the Falklands. The Labour Party had been split by the defections to the SDP. More importantly, the intellectual tide was flowing overwhelmingly in Thatcher’s direction; these were the halcyon days of neoliberalism, with the economy emerging from deep recession and the sale of council houses proceeding apace. Only weeks after a crushing electoral defeat, the situation for Labour, although obviously extremely difficult, is different in a way that Corbyn’s critics – especially those within Labour claiming he is unelectable – appear not to have understood. To understand why you need to think about the wider political background. In Britain – as in much of the Western world – the set of ideas that is often lumped together under the name “neoliberalism” has a near complete hegemony in Government. Policies are being pursued – especially following the economic crisis of 2007/8 – that involve reducing public expenditure, shrinking the non-coercive state, on the promise that this is the only way to engineer a sustainable economic recovery. But that recovery is palpably not happening. Faced with continuing and swingeing falls in living standards, increased Government deficits in the face of shrinking economies; increasingly insecure and short-term employment; continued asset price bubbles, especially in housing, to the point where the essentials of life are becoming increasingly unaffordable; and, most of all, globally increasing inequality to levels not seen for more than a century, it’s obvious there is a huge problem. It’s perhaps best exemplified by the fact that, in Britain at least, the number of people in full-time work who are falling into poverty is rising substiantially; the basic deal behind market capitalism, that a worker can achieve a decent standard of living by selling their labour, increasingly does not hold. Morevoer, as a strategy for reducing the deficit, it has failed spectacularly. At the same time, the social democratic parties that presided over the welfare capitalism of the 1950s and 1960s are in deep existential crisis. In Britain, despite the cruelties of the coalition, Labour suffered a crushing defeat in the 2015 election. It was wiped out in Scotland, once its heartland. The official reaction to this defeat has been to assume that Labour can only win by moving its policies closer to the Tory government – on social security, on immigration, above all on deficit reduction. In other words, the ground over which mainstream political debate is conducted is being narrowed, while increasingly those excluded from that debate are bearing the brunt of the politics of austerity. There is a comment usually ascribed to Karl Rove about the politics of the liberal social democratic opposition to neoliberalism: “when we act, we create our own reality. And while you’re studying that reality – judiciously, as you will – we’ll act again, creating other new realities, which you can study too, and that’s how things will sort out. We’re history’s actors …. and you, all of you, will be left to just study what we do.” Change that last “study” to “follow” and you have New Labour’s dilemma expressed with brutal clarity – it’s still fighting a war when the battlefront is elsewhere. And people can see that; its language no longer inspires because reality has moved on. Talk of “electability” is two elections out of date; it has nothing to say in particular to those who have walked away from political engagement in bewilderment and, quite often, disgust. In 2015 the Conservative Party gained a Parliamentary majority with 24% of the electorate; Labour was wiped out in its Scottish heartland by a party offering the appearance (if certainly not the reality) of being anti-austerity; but its leadership still says that electoral success lies in adopting the language and framing that wooed barely a quarter of the electorate, while millions of the young, the poor, the most vulnerable stayed at home – or voted SNP, Green or (especially in Labour’s traditional heartlands) in despair for UKIP. Labour held millions of conversations, but, it appears, at no more than the most superficial level. Labour activists and organisers talk about the doorstep; but often seem to me to be afraid to have real conversations that offer challenge and hope. What the Labour leadership election has done is blown that open. In previous elections, candidates from the left have stood – and even encouraged from the Right to stand – in order to ensure a “debate”, after which the inevitable win for a centrist candidate has ensured that Westminster usiness as usual can be carried on with an apparent mandate. Corbyn’s candidacy – apparently conceived in the same vein, as the means to a debate – has changed everything and brought people flooding into the Party. Why? Because, for the first time in decades, a candidacy in a Labour leadership campaign has connected with intellectual, political and social currents outside the immediate Labour Party – something far bigger than the Labour Party has in recent years become, but – I’d argue – something much closer to the purpose for which Labour was founded. It’s not about Corbyn as an individual – decent and principled though he undoubtedly is – but about the values he espouses, and most of all about the fact that he articulates a challenge to the politics and economics of austerity, in a way that reaches out to a far bigger audience than existing mainstream politics. This is about taking control of the political narrative; about offering, not a reaction to neoliberalism but an alternative to it. Corbyn has tapped into value systems that have remained confined to the fringes or expressed quietly by Labour members in defiance of their Westminster masters; a value system that found expression in the vote for the SNP in Scotland. And it won’t do to talk about entryism – it’s just not credible. Michael Crick of Channel 4 News has offered a fine and useful analysis – summed up in a sentence, there just aren’t that many Trots. This is something bigger, to which the Labour mainstream appears to have no response whatsoever. There is a narrative that states, Tony Blair won three elections for Labour. We can therefore only be electable from the centre. That first of all misunderstands the nature of triangulation – it was about the use of conservative language to provide space for progressive political measures; something that New Labour achieved significantly in its pre-Iraq phase. But more importantly it misunderstands the fact that the economic fundamentals have changed. New Labour was based on harnessing growth from a largely functioning economic system to pay for moderate redistribution; but, after the 2007-8 crash that option has not been available – the extent to which market capitalism is broken is much more obvious. Real wages have fallen to the point where in-work poverty is rampant (making talk of being “the party of work” basically frivolous). There is, in the UK, an effective investment strike in which capital stock is not even being renewed. Given that the UK has a sovereign currency, all of these issues are far more significant than the deficit; yet Blair’s successors seem unable to move beyond that. Their mindset is in the mid-1990s, unable to come to terms with what has happened since then. Electability comes down, in the end, to relevance. Corbyn’s insurgency, going way beyond the mainstream Labour party, has connected with trends and thinking that lies completely outside the Westminster bubble. Above all, it has been founded in hope – a belief that things can be different and that the Labour Party can be, once again, the vehicle to make that change. In the meantime, conventional social democracy is, throughout Europe, in crisis because it cannot break out of the neoliberal framing of economics and politics – it allows itself to be defined by its opponents. That brings huge challenges. To win elections, form governments and effect change you need structures and discpline. The Green Party’s disastrous track record in Brighton shows what happens when you have neither; Green councillors, faced with tough decisions, either threw a strop or threw in the towel. Labour is a party of Government – its unique genius has been to bring together a broad progressive group of often diverse people and to build on that diversity to deliver in office – and has to do so much better than that, and the need to take tough decisions in the face of conflicts and trade-offs is going to require discipline from supporters and, from its leaders, a commitment to openness and accountability a world away from New Labour’s top-down institutional authoritarianism. But the possibility is there. For Labour, this looks like a choice between a high-risk vote for a leader who can lead its adaptation to a very different world to that faced by Tony Blair twenty years ago, and who can help it to lead the debate, and electing a leader who cannot see the changes going on outside the Westminster bubble and offers no real alternative to the neoliberal value system. For me, the latter is simply a guarantee of further decline; it is the former that offers the way to move the debate away from neoliberal territory and to reconnect with the voters who have in their millions turned against a political system that simply doesn’t offer an alternative. Obviously I do not know what the outcome of the election will be, and I suspect it will be a much closer affair than the media currently suggest. But whoever is Labour leader will have to face some fundamental decisions; the genie cannot be rebottled. The choice seems to me to be simple – a choice between harnessing and leading the surge in support that has brought hundreds of thousands into the Party – high risk but with the possibility of effecting real change – or a turning away back inside the Westminster bubble and a slow but inevitable decline. I want to see the Labour Party as a force that can deliver real change, and which does not accept austerity as inevitable; which can react to the fundamental changes in political discourse the Corbyn surge exemplifies. And that’s why I’m backing Jeremy Corbyn as the electable candidate. This entry was posted in Political culture, UK politics and tagged austerity, Brighton and Hove Green Party, Cardiff, Green party, Jeremy Corbyn, Karl Rove, Labour Party, Michael Foot, neoliberalism. Bookmark the permalink. Indeed, the argument around electability should not ignore the fact that the “electables” have just lost two. The “electable” candidates all assume that in five years thing will be pretty much as they are but a bit worse. It’s much more likely that there will be a lot of desperate people who once felt desperately secure. Of course if the financial bubble bursts again, there may well not be an election at all. Ok to share this on Think-Left.org, Neil? Absolutely fine by me. Thanks. By offering a pink alternative of the Tories neoliberal agenda just allows the “centre ground” to move right and for the Labour Party to try and regain it, is for the Party to lose its reason.